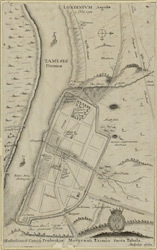 The title of this engraved map of Roman London appears along the top, with compass rose at top right. The arms of the Count of Pembroke, to whom the map is dedicated, are depicted at bottom right. Published in 'Itinerarium Curiosum' by William Stukeley, an antiquarian with a scholarly interest in sacred history, the plan shows the Roman street plan and road network, with illustrated views of the city wall and other prominent architectural and geographical features.